I was the kind of kid who gobbled down everything in sight, so I wasn’t really prone to playing with my food. 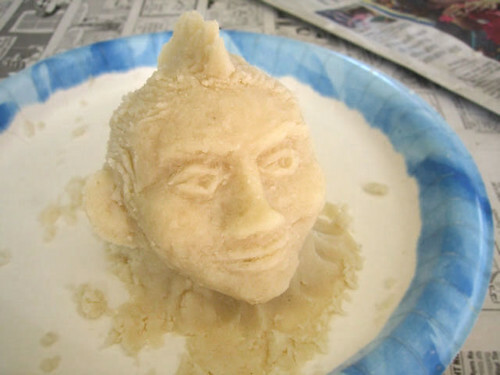 Still, instant mashed potatoes always impressed me with their potential to become very silky play dough. 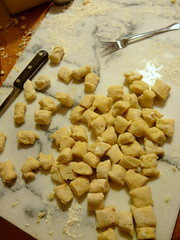 Gnocchi turns that impulse on its head: you need to shape it with your hands, but not let it turn into a gummy paste. If you give in to the temptation to mash and squeeze and pinch and prod, you’ll end up with leaden lumps that aren’t worth the effort. 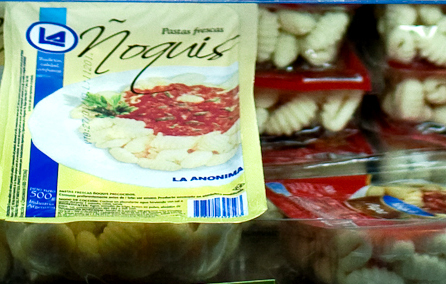 We’ve picked up frozen gnocchi before and I never found it terribly appetizing. It was the sort of food I liked in theory, but always found disappointing. Despite my preference for hands-on cooking, the dire warnings in cookbooks about failed, drowned gnocchi were kind of intimidating. Perhaps my trepidation helped me keep a light hand, but these came out great for me. I chose to make these Monday night because I was looking for a main-dish made of potatoes that wouldn’t be too heavy or greasy. I was home alone and everyone else was going to come home late, tired and hungry, so it seemed worth a bit of extra effort. I still found shortcuts where I could, though – using the microwave and starting the water early are key. Another night when I have more to do or don’t want to be in the kitchen, I’ll throw a few cans and boxes together and get a bag of vegetables from the freezer. This night I wanted real food and the satisfaction of watching my family come through the door and relax into smiles. 1. Scrub potatoes well, poke with a fork all over and place in a large glass casserole dish with a lid that will seal in steam. Place in the microwave and cook 16-20 minutes, or until they are tender (poke with a fork, if it goes in easily they’re done, if it seems hard still, add more time). 2. Put a large pan of water on the stove and add the salt. 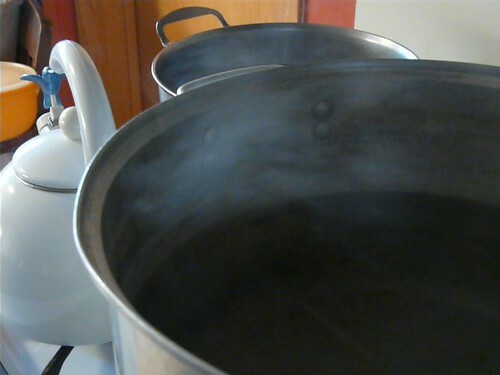 Bring to a boil while working on the rest of the steps. 3. 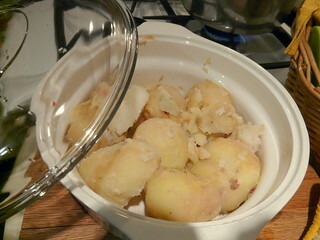 Uncover the potatoes and let cool enough to skin. 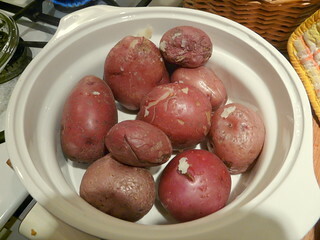 Pick out any eyes or other dark marks on the potatoes as you skin them, but try to leave them whole. 4. 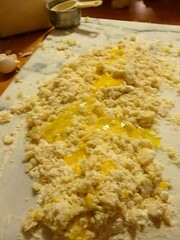 On a large clean work surface, sprinkle out 1 cup of the flour in a large even space. 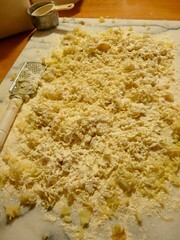 Using a hand grater or food mill, grate the potatoes over the flour. This should result in “riced” potatoes that are not lumpy or overly mashed – you don’t want them to be worked until they get gummy, so a food processor will not be a good substitute. 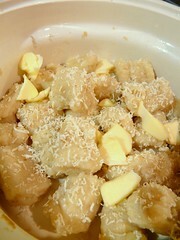 Sprinkle another ½ cup of flour over the riced potatoes. 5. Break the egg and dribble it over the potato mixture, then sprinkle with a little freshly grated nutmeg (or a pinch of pre-ground nutmeg). Gently mix everything together until it begins to form a dough, adding more flour if necessary to keep it from getting sticky. How much flour you need will depend on how fresh/moist the potatoes are. 6. 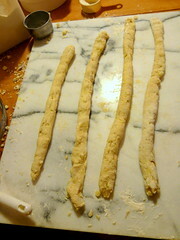 When the mixture is dough-like, divide into four chunks and gently roll them into ¾” wide “logs” – they’ll probably be 12-18″ long. Cut into ¾” chunks. 7. Use a basic table fork to create the pattern on each chunk, holding it on top of the fork and rolling it up along the tines to create ridges on one side and a pinch with the thumb in the middle. I won’t enter into any competitions with Italian Grandmothers anytime soon – I’m not going to repeat what my sister said mine looked like (ungrateful wench) but they tasted great even if they weren’t perfect. 8. 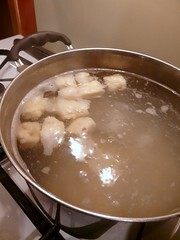 The water should be boiling heavily before you begin to cook the gnocchi. Add half of them at once and let them cook until they just float to the top. They should cook rather quickly – less than 5 minutes per batch. 9. Scoop them out of the water quickly and let drain before putting them into a large dish and tossing with butter and parmesan.